I think there’s a rule somewhere that you’re not allowed to share all of your admirable ideologies without also sharing some embarrassing missteps, so here you go. A woman and I entered the elevator of my apartment complex together the other day. She was in a wheelchair. We said hello to one another and she was very kind and chatty. After a few exchanges she said, “This is new, so I’m still getting used to it!” I didn’t know what she meant, but my brain immediately assumed she meant her wheelchair. It was at the forefront of my mind, so why wouldn’t that be what she meant? I said, “Oh, nice. Did you have a similar one before?” She gave me a puzzled look. My heart sped up a tad. I prepared one of my feet for mouth-sticking. No. No, she didn’t mean her chair. “Oh, no. The apartment complex is new to me!” she smiled sweetly, not seeming the slightest bit annoyed by my assumption. “Oh, welcome! We love it here!” I said, adding a hasty goodbye when I got to my floor. I proceeded to die of embarrassment in the hallway outside my door. It was an honest mistake and it wasn’t the end of the world. Who knows? She might not have thought twice about it. But it did reveal a hidden thought process in my mind that I want to adjust: a thought process that assumes that people’s different abilities are their only story. Oops. I appreciate her generosity towards me, but I still recognize the need for some reflection on my part. We’re always works in progress, right? Let’s put these cinnamon rolls in our mouths instead of our feet, shall we? Pumpkin tastes much better than feet. 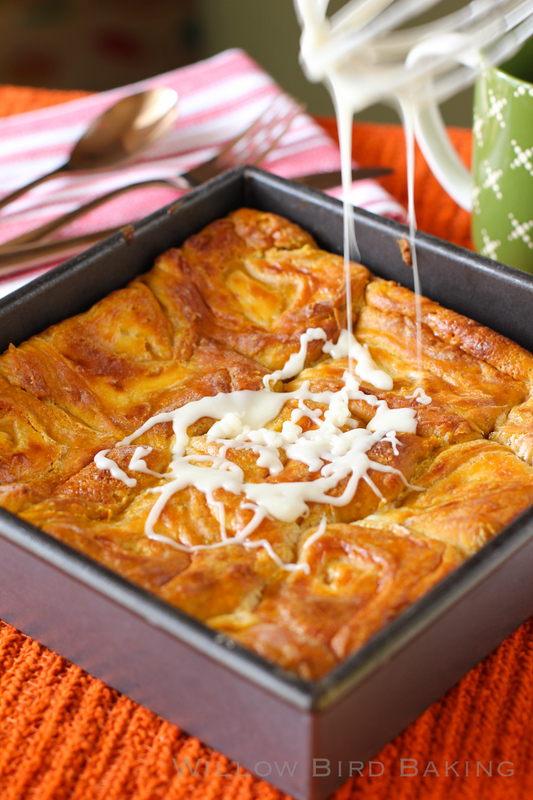 These Pumpkin Cheesecake Cinnamon Rolls are all gussied up for fall. They start with a pumpkin yeast dough that gets filled with a thick cheesecake mixture before being rolled up, baked, glazed, and topped with Maple Candied Pecans, because why not? Enjoy! When have you found your foot in your mouth recently? 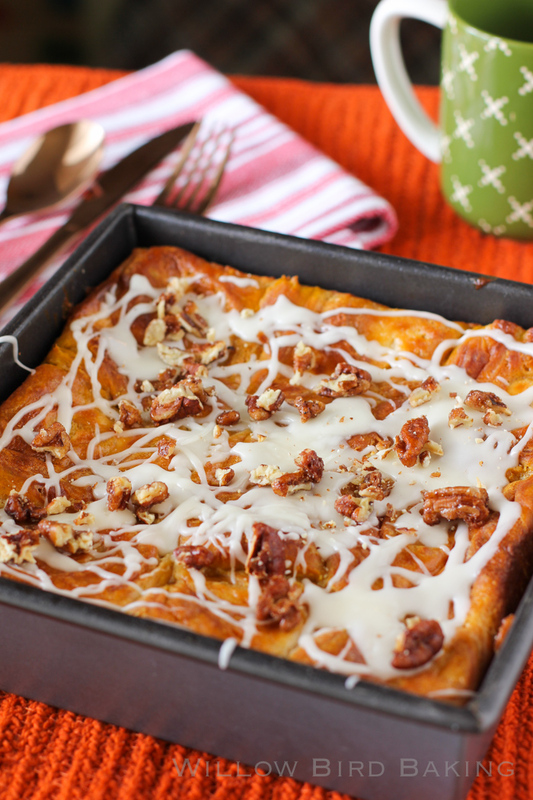 PUMPKIN CINNAMON ROLLS WITH CHEESECAKE FILLING. That is all. OH WAIT, plus maple candied pecans! Okay, that is all. Note on proofing: This yeast dough proofs for a couple of hours after you mix it up, and then the assembled rolls proof in the fridge overnight, so allow for this when planning to make this recipe. With most cinnamon rolls recipes you could switch this and proof in the fridge overnight and then assemble and proof on the countertop, but I opted to switch that method with these because I didn’t want the cream cheese filling sitting out too long. Note on yield: I don’t recommend halving yeast recipes; instead, if you don’t want 24 rolls at once, consider freezing some for later. Note on freezing: To freeze some of the unbaked rolls, just wrap them well before the second rise and freeze them. Once frozen, pop them out of the pan all together and store in the freezer, wrapped in plastic wrap and in a zip top bag or wrapped in foil. When you want to bake them, stick them back in a greased pan, thaw them in the fridge overnight, proof for the instructed amount of time, and bake like usual. Make dough and do first proof: Mix the warm water and yeast in a medium bowl and let the yeast foam for about 10 minutes. Put 2 tablespoons white vinegar in a measuring cup and then add milk up to the 2 cup line. Set this aside. In a separate large bowl (or the bowl of a mixer fitted with a dough hook), whisk together flour, sugar, salt, baking soda, baking powder, cinnamon, nutmeg, allspice, and cloves and cut the shortening into the mixture with two knives or a pastry cutter until the shortening looks like small peas. Stir yeast mixture, milk mixture, and can of pumpkin into the dry ingredients and mix well, kneading just a few turns. Transfer the dough to a bowl lightly sprayed with cooking spray, cover tightly with plastic wrap, and proof in a warm, draft-free place (such as a closed, turned-off oven), for around 2 hours or until doubled in size. Prepare filling: After proofing the dough, lightly spray a 9 x 13-inch baking dish (glass works best) with cooking spray. Cream the softened cream cheese in a medium bowl until fluffy before adding sugar and egg. Mix together until well combined. Proof and bake: Cover the rolls let them rise in the fridge overnight (they will have nearly doubled.) When you’re ready to bake, preheat the oven to 400 degrees F, letting the rolls rise on top of the preheating oven covered by a clean dish towel for around 1 hour. Bake them for about 25-30 minutes or until lightly browned on top (don’t underbake or they’ll still be doughy in the center, but be ready to cover them with a sheet of foil in case the cream cheese layer starts to brown.) Brush with 2 tablespoons melted butter and return to the oven for 1 more minute. 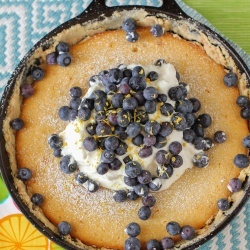 Whisk together the melted butter, powdered sugar, and vanilla for the glaze. Add water 1 tablespoon at a time until you reach desired consistency. Drizzle over slightly warm rolls. Top with Maple Candied Pecans. Oh goodness! We have all been there where we want to crawl in a hole! And luckily you realize how you felt so next time you can react better! Life is all about the ups and downs, right?! 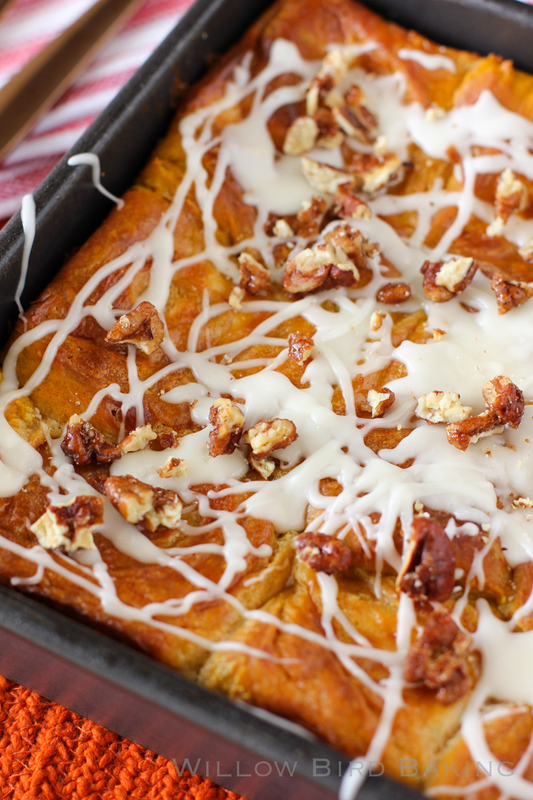 And these pumpkin rolls are screaming for thanksgiving morning! Oh dear, I can’t handle social awkwardness, I can’t even watch shows like The Office 🙂 We all say things we regret, luckily the lady was gracious enough. She sounds like a good neighbor! I absolutely love the color of these rolls- they look amazing! Perfect for fall. Shut the front door! These look absolutely amazing!!! Wish I was biting in to one of these right now!! What a perfect recipe for fall! I don’t think I’ve ever made cinnamon rolls from scratch; definitely going to give these a go. 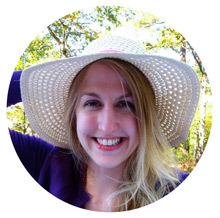 It was an honest mistake — I do think though, that you’re right, it’s human nature I think to automatically assume that when someone has a disability, or something that makes them unique that we as people think it’s their only story, or even if not only story, their top story. Sounds so good and perfectly Fall! Die. I would totally have thought she meant being IN a wheelchair. At which point I would have said, I’m so sorry. Imagine!!! I would have died a little bit too but I bet she didn’t think a thing about it! These cinnamon rolls, however, I wouldn’t be able to forget!! Oh man, Julie, I totally relate! I feel like I do things like this at least once a week and I just cringe like crazy. Luckily, this woman seems like a generous spirit and hopefully you’ll see her around and have a non-cringey moment 🙂 These rolls look like everything I ever wanted out of fall! Just curious if the measurements are correct…….Thought this would be a perfect item for my FIL …and when it came to flour, I used 5oz for a cup, as per atk recommendations, so if anything might have been extra, and the dough was soooooo wet that i didn’t just add a cup but cups of flour…..ended up over working the dough i’m sure trying to get to a point where it could be rolled out, still stopped on the wet side 8(…………Just curious, i know weather can effect a recipe but not as much as i had to use. The measurements are correct — 6 cups of flour. The dough is a wet and sticky dough, but after rising and with a heavily floured counter, it’s lovely to work with 🙂 I do use a bench scraper to help me roll them up. That sounds so embarrassing, but I bet she didn’t mind at all! These cinnamon rolls sound so deliciously decadent!